← The Planet Mars. Date unknown. Statesville, North Carolina. February 11th, 2011. Eroding pack dirt around a culvert is causing a road in northeast Statesville to become increasingly dangerous to cross. The closest business to what is fast becoming a sinkhole is Harkey Electric, Inc., run by brothers Steve and Robert Harkey. Steve Harkey said the road damage literally gets worse on a daily basis. 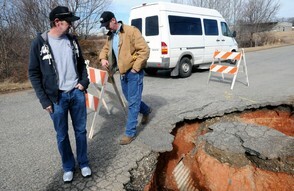 This entry was posted in Pictures and tagged sinkhole, South Carolina, Statesville. Bookmark the permalink.